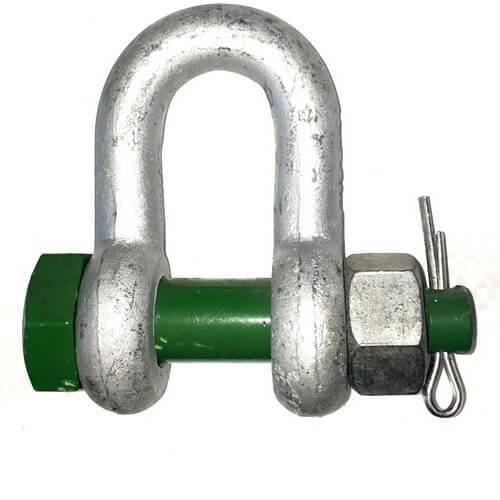 With similar specifications to our screw pin alloy dee shackle, this type offers additional safety as a semi-permanent connector. This page refers to the safety bolt alloy dee shackle (may also be referred to as a green pin alloy dee shackle). Why choose the safety bolt alloy dee shackle? The high safety factor along with the cotter pin secured bolt makes these lifting shackles perfect for use is long term operations. 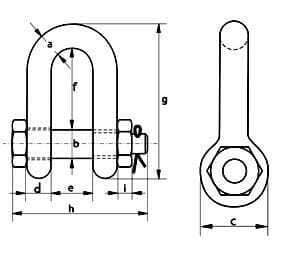 As with all lifting equipment you should inspect the shackle prior to each use to ensure the bolt remains secure and the pin is still in position. Do not use if the pin is absent, replace immediately. With a 6:1 safety factor you are assured of safe lifting within the stated safe working load limitations. These shackles meet many standards including the EU13889 & US Fed spec RR-C-271 type IVB class 3 and are grade A hot dipped galvanized. You can also use this shackle in temperatures outside the usual – down to -20 degrees C and up to + 200 degrees C.
At the lower end of our safety bolt alloy dee shackle range we start with working load limits at 2 tonne which is often enough for mainstream everyday tasks. Then we go to the top end of the spectrum to our largest 85 tonne shackle with dimensions to suit; these are used for more odd ball and specialist lifting tasks. To discuss your needs you can simply call 01384 78004 where you will also be able to place an order and make a card payment. If you would prefer to email us then please use either the contact us page or the rapid enquiry form button. Safety Bolt Alloy Dee Shackle Overall rating: 5 out of 5 based on 6 reviews.